UPDATED with mysterious light photos July 24, 2006 Petersfield, Hampshire, England – It is so hot in southern England right now that the London Zoo is feeding blood-flavored ice blocks to the lions to help keep them cooler. The hottest day ever recorded in a British summer was on July 19th. London’s Underground subway system has no air conditioning and temperatures have reportedly reached 117 degrees Fahrenheit, while road surfaces south of London have been melting. Paradoxically, the U. K.’s spring was one of the coldest and wettest on record, slowing down the growth of cereal crops to as much as eight weeks behind schedule. Until recently. Now all the heat has been making the wheat and barley and other crops grow so rapidly that some farmers near Barbury Castle in Wiltshire County have already started harvesting some fields. 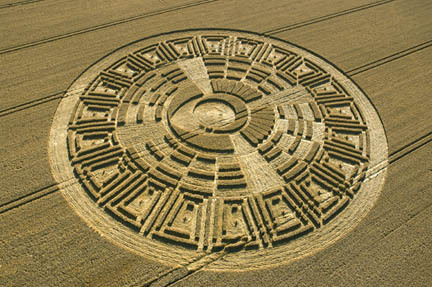 One long-time crop circle researcher and photographer is Lucy Pringle, who is based in Hampshire, England – one county that so far in 2006 has not had a single reported crop pattern. 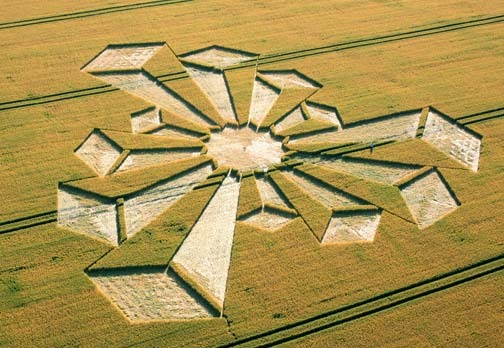 In previous years, there have always been Hampshire crop circles and no one knows why this year has been different so far. I talked with Lucy this week about her impressions of some of the most outstanding June to July crop formation, beginning with one reported on June 9th at West Overton. This was the first pattern for Wiltshire County in 2006. One eyewitness saw a small light flash rapidly out of the West Overton pattern. Those mysterious lights have long been associated with crop formations around the world. 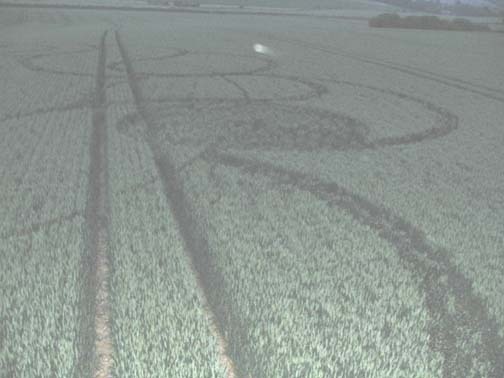 First crop formation reported in Wiltshire County on June 9, 2006, in young wheat. Aerial image © 2006 by Lucy Pringle, www.lucypringle.co.uk. Above and below: Two photographs in darkness before dawn (photos brightened for more clarity) on June 11, 2006, show mysterious, small light moving over the West Overton, Wiltshire, formation, which was first reported on June 9, 2006. 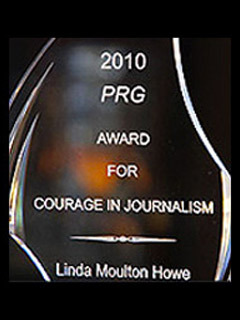 Photographs © 2006 by William Betts. Silbury Hill in background. 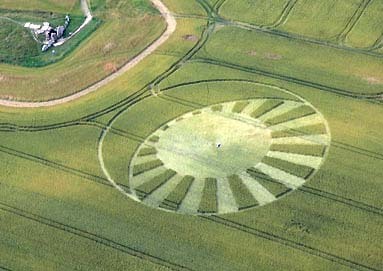 June 21, 2006, summer solstice pattern reported after night of police controlling crowds at Silbury and Avebury sacred sites on June 20-21, 2006. Aerial © 2006 by Steve Alexander. 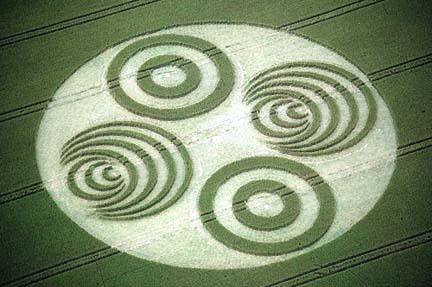 “TWELVE DAYS LATER AT SILBURY HILL NEAR AVEBURY AND WHAT LOOKS IN THE AERIAL TO BE AN EXTRAORDINARY PATTERN. WHAT HAPPENED? That was quite extraordinary in a way because it appeared on the night of the Summer Solstice. There were police all around at Avebury, which as you know is a great gathering place being a sacred complex among the stones. It was not all that far out into the field. But that was extraordinary that it appeared with all the police and people present that night. WHAT DID THE FARMER DO THE NEXT DAY? Well, the farmer the next day – I managed to fly over it and the very next day, he took the center out. 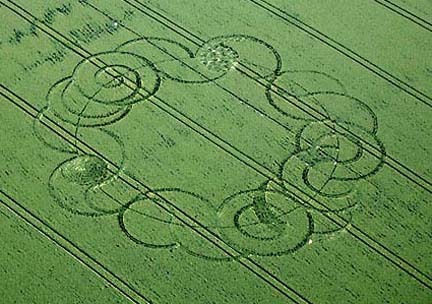 (laughs) He hates crop circles! He absolutely hates crop circles, so unfortunately none of us were able to get in to make a physical evaluation of the flattened crop. THAT WAS IN WHEAT, WASN’T IT? That’s right, young winter wheat. In fact, to the best of my knowledge, we have not had any in barley in Wiltshire. There have been one or two in barley in Kent. But what is so extraordinary is that we had the very, very cold spring and the crops were held back quite considerably. At one time, we thought there was a delay of about six weeks and then about two weeks. We’ve had intense heat – 35 degrees C. sizzling heat (in the 90s F.) for the past two weeks. This has brought the crops on so fast that they are nearly all turning color earlier than before. So I think that this season has caught up and it’s going to be – well, when I was flying the other day over Barbury Castle, they were harvesting already certain wheat fields. That’s early! YES, I’M SURPRISED TO HEAR THIS. YOU’RE TALKING IN CENTIGRADE, WHICH IS GETTING INTO THE UPPER 90 DEGREES F., WHICH IS UNUSUAL. It’s absolutely phenomenal for the U. K.
THIS CROP FORMATION BEING IN WHEAT ON JUNE 21, AT SILBURY HILL, IT REMINDS ME SO MUCH OF REPEATING PATTERNS ON THIS VARIATION OVER THE PAST FIFTEEN YEARS. I’M CURIOUS WHAT YOU YOURSELF AS YOU LOOKED AT THIS PATTERN FROM THE AIR, DIDN’T YOU THINK OF ALL THOSE OTHER PATTERNS THAT ARE VARIATIONS ON CIRCLES AND CRESCENTS WITH THE DOT IN IT. Yes, indeed. 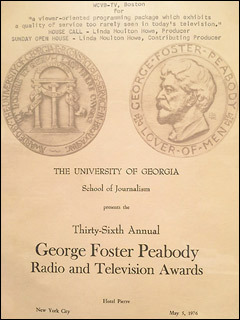 It does seem to be a variation on all the previous years, as you say. It was a very clean cut one from the air. Some people call it the ‘wink’ – with one eye shut and one eye open. But it’s unfortunate, if you can’t get into it to really examine it from the ground, you can only evaluate it from the air. 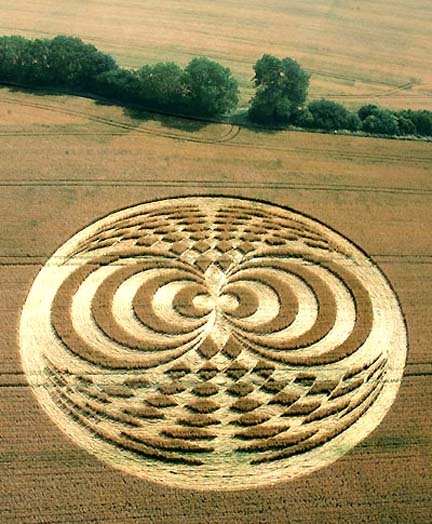 IT DOES STAND OUT TO ME AFTER LOOKING AT HUNDREDS OF CROP FORMATIONS SINCE THE EARLY 1990S THAT THIS DOES FALL INTO THE PATTERN OF ONE OF THE TRULY MYSTERIOUS. Yes, I think it does. You might say it’s slightly more old-fashioned. 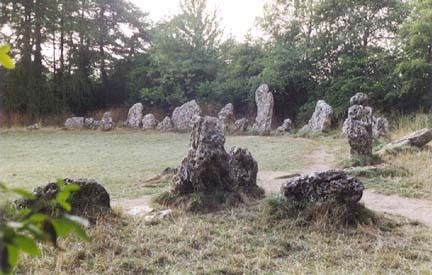 The Rollright Stones are among the more famous of the British stone circles. The site comprises a circle known as “The Kings Men,”and the remains of a megalithic tomb known evocatively as “The Whispering Knights.” Image from Megalithia. 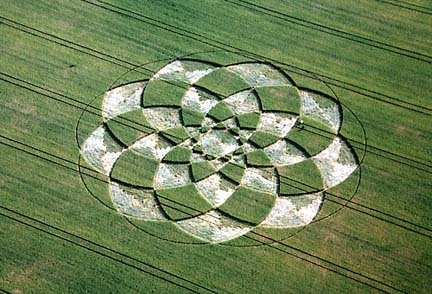 9-Fold geometry reported on July 2, 2006, in wheat near the ancient Rollright Stone Circle near Chipping Norton, Oxfordshire. Aerial image © 2006 by Lucy Pringle, www.lucypringle.co.uk. Yes, because the Rollright Stone formation – I flew up over that one, a 9-fold geometry or flower design. I SEE THAT IT IS SORT OF A MOTIF WITH STAR SHAPES OVERLAPPING AGAIN. Yes, it’s a 9-fold geometry. What was so lovely is that I got up at 5 a.m. that morning and I was in the air by 7:30 a.m. We flew all the way on a glorious morning. The Rollright Stones are very famous circle of stones. I went there one summer solstice and I can remember trying to count the stones and nobody can count the stones. There are thought to be between 70 and 80 in a circle, but nobody knows. WHAT IS THE PROBLEM IN COUNTING THEM? Well, this is one of the phenomena with ancient stone circles. There is some sort of electromagnetic field, which affects your brain. The area of your brain has to do with counting. I know just in the DNA formation in 1996 at the East Field, I could not count the circles in there when I was trying to bury my bottles (for water testing). Everybody was in fits of laughter. It’s the same effect. This is a well-known syndrome – that people within ancient stone circles due to the electromagnetic field present, they cannot count. They go round and round and say they are sure. There was a baker in the olden days who put loaves of bread around trying to count. But even then, he could not do it. And it is the most amazing place. HOW WOULD YOU INTERPRET THE 9-FOLD GEOMETRY IN RELATIONSHIP TO THOSE NINE ROLLING STONES? 9-fold is sacred, isn’t it? You get the sacred of the 9. It was just beautiful and nestled quite perfectly into the landscape and is part of the magic of the ancient rolling stones. IT IS BEAUTIFUL AND IT REMINDS ME OF SO MANY OTHER PATTERNS OVER THE LAST 15 YEARS IN VARIATIONS ON THIS. Aerial image © 2006 by Nick Nicholson and Cropcircleconnector.com. 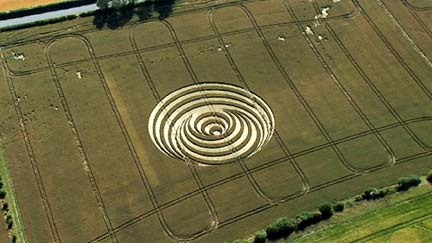 GOING THEN FROM JUNE 21 AND THE SOLSTICE TO JULY 3, AT AVEBURY TRUSLOE, WHICH IS NOT FAR FROM SILBURY HILL, COULD YOU TALK ABOUT WHAT PEOPLE CALL THE ‘3-D’ FORMATION OF A SERIES OF CIRCLES THAT DO APPEAR TO RISE UP OUT OF THE FIELD? Yes, what was interesting is that if you bent over one half of the formation and fitted it into the other half, it would fit in perfectly because the center of one is depressed. The other corresponding part in the other second part of the formation is raised. If you folded them over, they would actually fit in the most amazing way. RIGHT. I’M LOOKING AT THE PHOTO AND I CAN SEE THAT, LUCY. It looked truly beautiful from the air – I can’t tell you! And I went into it the day after it appeared and unfortunately it belonged to the same farmer on Silbury Hill. I was only in it for about ten minutes with David Cayton and Robert Hulse and various other people. The farmer was absolutely determined that he was going to take it out. The farmer said, ‘Well, that’s my prerogative, isn’t it?’ And of course, it IS his prerogative. This is what we must not forget. It is their (farmers’) land. It is their livelihood. And they get fed up with people coming in not asking permission. I think this is something we must bear in mind. I think a lot of farmers in Wiltshire this year have said they are going to cut them out as soon as they appear. DID HE DO THAT WHILE YOU WERE THERE? DID HE CUT THIS ONE DOWN? Yes, he did. He came in with his harvester machine and he asked us all to leave, which we did. SO IT WAS ONLY THERE FOR TWO DAYS? Well, I suppose a day and a half. IT’S SAD BECAUSE THIS ONE PERHAPS OF ALL OF THEM THIS YEAR – IT WOULD HAVE BEEN FASCINATING TO SEE WHAT SOME GROUND ANALYSIS WOULD HAVE GIVEN. I only got so far in the pattern. I did see little kinks in the crop, little tiny white lines over some of the crop. I did find some crushed. I can’t say whether that was due to somebody walking over it and because there were other people in it. I just have to say I have no opinion about that. 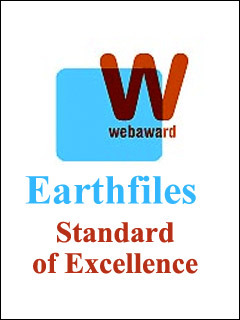 This is where it is so extraordinarily difficult to carry out ground research unless one is really in it very soon after it has appeared and before a whole lot of people get into it. GIVEN THE FACT THAT SO MANY PEOPLE WERE IN THERE A DAY AND A HALF BEFORE THE FARMER CUT IT DOWN, A LOT OF THAT DAMAGE COULD HAVE OCCURRED BECAUSE OF ALL THAT HUMAN TRAFFIC. Indeed it could. And this is where I think an awful lot, or majority of times, one has to say: I have no opinion. I cannot have an opinion because I was not there when it formed, so I don’t know. It was very beautiful. Aerial image © 2006 by Verity Bullock. I WOULD LIKE YOUR OPINION ABOUT ANOTHER PATTERN BECAUSE IT IS SUCH A THROW BACK TO 1990, 1991 TO 1992. THAT IS THE PICTOGRAM AT BLOFIELD NEAR BRUNDALL, NORFOLK. Yes, it does take us right back to the early days, to 1990 or 1991! It’s a long pictogram with circles that are joined together by shafts and then there are extremities coming out from the circles. And then it’s a huge thing, a linear thing with the shafts linking the circles. I WAS CURIOUS IF YOU KNEW ANYONE YOU TRUSTED WHO HAS BEEN IN THIS ONE? HAVE YOU FLOWN OVER IT YOURSELF? No. That’s a long, long way over. It’s almost right on the East Coast (of England) in Norfolk. That is almost half the width of southern England from where I am in Petersfield, Hampshire. 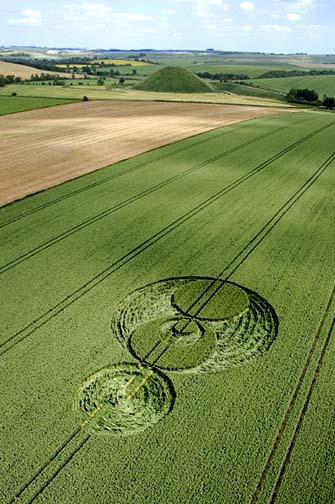 THAT’S SIGNIFICANT IN ITSELF BECAUSE WE HAVE BEEN USED TO KNOWING THERE WERE CROP FORMATIONS IN WILTSHIRE AND IN SURROUNDING COUNTIES AROUND WILTSHIRE. BUT TO HAVE THIS EXTRAORDINARY THROWBACK TO THE BEGINNING OF THE 1990S SO FAR AWAY IN NORFOLK, IT MIGHT BE MORE SIGNIFICANT THAN ANY OF US UNDERSTAND? I think one of the interesting things is that we have this band of chalk (limestone) and that goes right across southern England and right out at Suffolk. It just borders on to Norfolk as well. 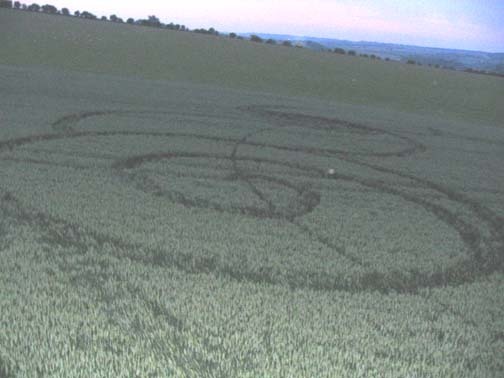 We know from the geophysical surveys which were conducted about six or seven years ago, that about 93% of all the crop formations in England appear on chalk land where you have the aquifers underneath, which respond and react to the electrical force when these formations appear. Aerial image © 2006 by Lucy Pringle, www.lucypringle.co.uk. ONLY FIVE DAYS LATER ON JULY 8, IN OXFORDSHIRE ON THE BORDER OF WILTSHIRE AT WAYLAND’S SMITHY NEAR ASHBURY, OXFORDSHIRE, IT IS SOMETHING THAT AGAIN SEEMS TO HAVE A 3-D MOTIF. THE REASON WHY IT’S WORTH DISCUSSING IS THAT LAST YEAR WERE THE EXTRAORDINARY MAYAN TYPES IN WAYLAND’S SMITHY AND NEARBY. Yes, that was a curious one. It has caused a lot of controversy. Either people like it or they hate it! Some people really hate it and some absolutely love it. I think that is almost beside the point in a way because this is a totally new development. It’s a completely new advance because the 3-D effect and the way the planes, the geometry is constructed, are just out of this world. And the way the ends of the skyscrapers – it’s almost like a piece of jagged crystal. At the end, the lay of the crop is different in almost every single end of the jutting out pieces. I know that David Cayton went in and said there was human evidence. Aerial image © 2006 by Cropcircleconnector.com. But the pattern at Uffington Castle, Ellis Taylor who went in said it was beautiful – the feathery motif. That again is a completely new departure, isn’t it? EXCEPT FOR THE WINGS IN SOME OF THE MAYAN TYPE GLYPHS IN THE PAST. That’s right. 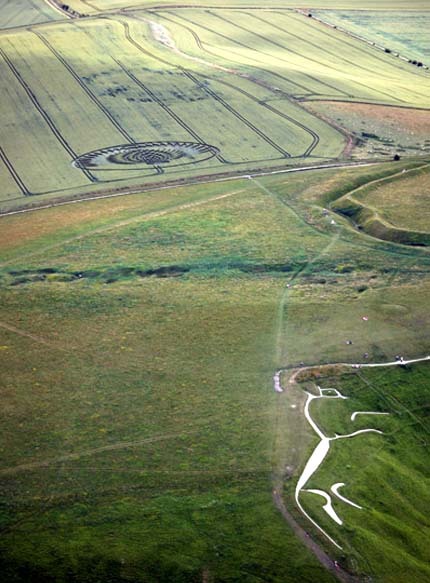 And I think they were saying on the cropcircleconnector, the White Horse at Uffington is linked to the goddess, Rhiannon, which was connected to birds. So, there it is absolutely on the other side of the White Horse. Many of these things are linked to sacred sites and the energy of those sites must play a part in the interaction, I think, between the force and the appearance of these wonderful formations. 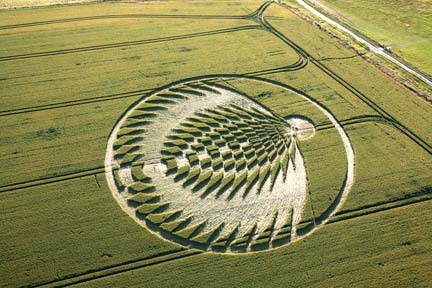 IT’S ALWAYS BEEN MY HYPOTHESIS THAT IT’S ANCIENT INTELLIGENCE THAT IS INVOLVED WITH THE CROP FORMATIONS. I agree. And focuses on the ancient, sacred sites and mounds. Birds possessed supernatural powers and, through Celtic myths, divine entitled frequently shape-shifted between human and bird form. Birds are a potent force in Celtic mythology, often symbolizing the flight of spirits to the Otherworld. In Welsh mythology, Llew (known as Lugh in Irish) was turned into an eagle at the moment of his murder. Herons, cranes, storks and pelicans are related to the gods and goddesses that preside over the mysteries if reincarnation, acting as guides to the Underworld. Birds evoke ideas of freedom — the human soul liberated from the body at death. Often three birds appear together in symbolism, all pointing to the Three Fates, the Sisters of Wyrd. Savernake Forest near Marlborough, Wiltshire, reported July 8, 2006, in wheat. Aerial image © 2006 by Lucy Pringle, www.lucypringle.co.uk. THREE DAYS AFTER THE ‘RHIANNON BIRD’ EMERGED NEAR UFFINGTON AND WAYLAND’S SMITHY, AN OUTSTANDING PATTERN WAS REPORTED AT SAVERNAKE FOREST NEAR MARLBOROUGH. What was interesting is that in some of the arcs, which twist around, they are not actually closed arcs. They are not actually circles. There is a little sort of entrance and it seems to me that you are invited to go into that one and maybe experience something rather special. 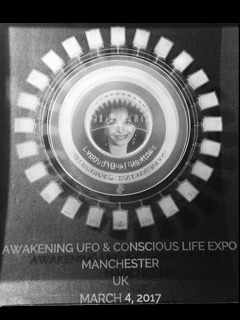 You know how we go into other dimensions and other levels of consciousness. That one is inviting us to do exactly that sort of effect. IT REMINDED ME SO MUCH OF THE 3-D CROP FORMATION AT AVEBURY TRUSLOE. It’s got the same 3-D aspects, yes. But again, it’s a variation on that theme. 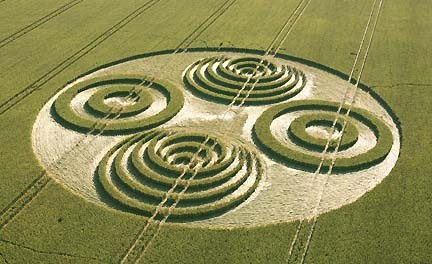 An echo of Savernake Forest pattern reported three days earlier on July 8, 2006. Aerial image © 2006 by Julian Gibsone and Cropcircleconnector.com. “Electromagnetic fields”? Or “transversible wormhole”? 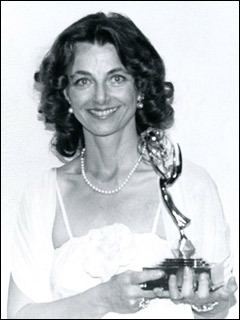 Reported July 20, 2006, at Old Hayward Farm near Straight Soley, Wiltshire. Aerial © 2006 by Steve Alexander. SINCE THE FARMERS ARE THREATENING TO CUT DOWN THE PATTERNS IMMEDIATELY, HOW ARE YOU GETTING OVER THEM WITH YOUR BEAUTIFUL PHOTOGRAPHS SO QUICKLY? I’ve got a network of information going. As soon as certain people verify something, they tell me. I pass it on to other people and so we have a network going. I think this is important. The thing that is slightly concerning me is my scientific day coming up this following Sunday. I’m particularly interested in the hormone level tests. In the past we have had some quite compelling results which make one think: how does that happen? For instance, one of the results we have had is tremendous fluctuations in the thyroid glands. That’s a very slow moving gland, not like our adrenals which obviously move fast. They have to because they are a fight or flight mechanism. They have to respond quickly. But the thyroid is a pretty slow moving, sluggish gland. One year, Annie McCathrie, who was there a couple of years ago, she had a 40% drop in her thyroid levels over a period of two hours from the time we had gone from the control test and gone into the formation. There was no explanation for that. In fact, a biotechnician with us was concerned about that and said, ‘Let’s hang on and test her again an hour later.’ It came up a bit, but she was still about 30% down, which is huge. We would not expect that to happen normally, except over a period of several months, not two hours! RIGHT, IN TWO HOURS, THERE WAS THAT DRAMATIC CHANGE. AND IN WHICH FORMATION WERE YOU IN TWO YEARS AGO? 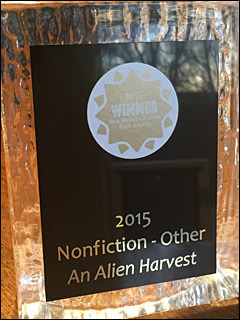 That was in the one that on David Hughes’s land at West Kennett (July) That was very, very strange, quite bizarre. West Kennett Longbarrow near Silbury Hill, Wiltshire, reported July 13, 2004. Aerial © 2004 by James Willard-Smith, Jr.
Wayland’s Smithy – Countdown to August 2007? 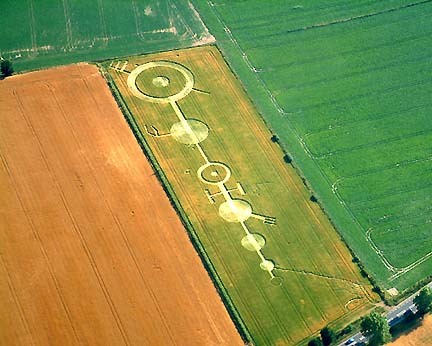 Since Wayland’s Smithy, Oxfordshire, has had groundbreaking crop formations in both 2005 and 2006, here is some brief background. Wayland’s Smithy is one of the great Neolithic burial chambers in Britain, more than 5,000 years old. This ancient grave near the Uffington White Horse was named after Wayland, the Saxon god of metalworking. c) its three longest arms show some kind of end detail that tells (presumably) when the rays will reach Earth. If astronomical, the scientist wonders, could it be a cyclic event such as an energy pulse from the black hole at the center of our Milky Way galaxy? Or increased plasma eruptions from our Sun? Or other galactic event that humans have never experienced – but which the intelligence behind the global crop formations understands and anticipates? 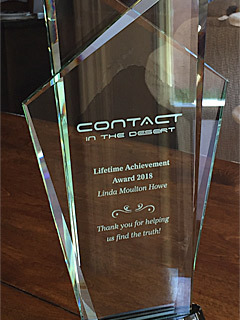 “The time available to me this year to go circle chasing is more restricted than has previously been the case and whereas before I was able to take my time it is now a question of finding a window of opportunity. 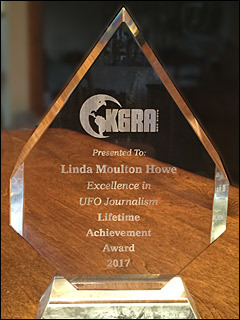 When Nick Nicholson phoned me late Sunday evening on the 11th June to tell me about an interesting new arrival near West Overton, Wiltshire, I decided to make the journey down from London that night. When I arrived at the lay-by just past the Bell Inn the full moon, which had accompanied me for most of the journey had disappeared behind clouds. This left me standing, pole, steps and cameras on the edge of the North Farm field in the pitch black of the night. It must have been about 2:45 a.m. when I began my forage through the gap in the hedge and into the dark, following the directions Nick had given me. I turned to my left and made for the 5th tramline which took me up the gently sloping field. As I approached the copse on my left I came across a series of wide circular tractor marks which swung across the tram lines. 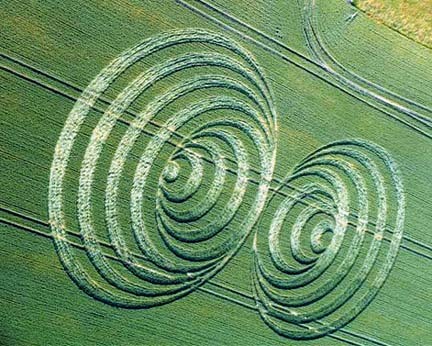 These surely couldn’t be part of the crop circle Nick had described to me over the phone. I hesitated, moved up further then turned back. Nothing else came into view. I was lost. I returned to the bottom of the field and started up one of the other tramlines, again arriving level with the copse on my left. Still no crop circle. I never cut across standing crop and it seemed like miles walking up and down these tractor lines, the field appeared to go on for ever. On my third attempt I once again got more or less level with the top of the copse and was again on the point of returning to the bottom of the field, despairingly, when something happened that stopped me dead in my tracks….a streak of light, like a honey coloured comet tail, flashed past me at eye level no more than six feet from my head. It was there for a matter of seconds only and crossed in front of me from left to right towards the open field. The time was now about 3:30 a.m. and I looked at the copse close to my left then across the vastness of the field to my right. I decided to carry on walking up the hill and came across a narrow fox run crossing the field at right angles to the tramlines. I followed it, and, narrow as it was, by putting one foot carefully in front of the other I avoided crushing the standing stems of wheat on either side. Its twisting route took me across at least three tractor lines and I finally arrived at a point where I could see the dark mass of the formation below me. I spent what was left of the night and the early dawn taking photos and looking closely at the circle. The lay had a very spontaneous and natural looking flow, and although most of the stems were lifting back up to the light I again got the feeling of crashing waves and rushing water that I have had in other impressive crop formations. To consider whether this is man-made or ‘genuine’ misses the point, for me at least. The rather awkward design seen from the aerial views belies the experience on the ground. I felt it had a lot of energy. Few if any of the laid stems were crushed, crimped or broken, most were gently curved at the base and many of the nodes were bent horizontally to follow the flow of the lay. I could find no tell-tale white plank marks, although I suppose a garden roller could have been used, though the bloom on the stems was intact wherever I looked and there was no evidence of foot marks either. If it was man-made some team had gone to a lot of trouble to create it on land belonging, by all accounts, to a very unwelcoming landowner for little or no satisfaction or buzz; the formation had almost gone unnoticed…a few days more and the crop could have righted itself to render the taking of aerial photos pointless.